A UFO hunter says he has spotted a UFO hovering in the background of more than 30 different photos from the November 1969 NASA Apollo 12 mission. He believes that the find is remarkable and significant because the same UFO appears in multiple photos of the Apollo 12 mission as the astronauts walked on the Moon. Apollo 12 was the sixth manned flight mission of NASA’s Apollo program, and the second mission in which U.S. astronauts landed on the Moon. The mission was launched on November 14, 1969 from the Kennedy Space Center in Florida, only about four months after completion of Apollo 11. Mission Commander Charles “Pete” Conrad and Lunar Module Pilot Alan Bean landed on the Moon on November 19, and spent a day and seven hours moonwalking while Command Module Pilot Richard Gordon stayed in orbit. The mission ended on November 24. Below are some of the photos from the Apollo 12 mission showing what UFO Sightings Daily’s Scott Waring claims is an alien UFO stationed in the lunar sky, spying on the Apollo 12 mission crew while the astronauts capered around on the lunar surface. The full-length photos may be viewed here and here. Warring also provides close-ups of the “alien drones” shown below. 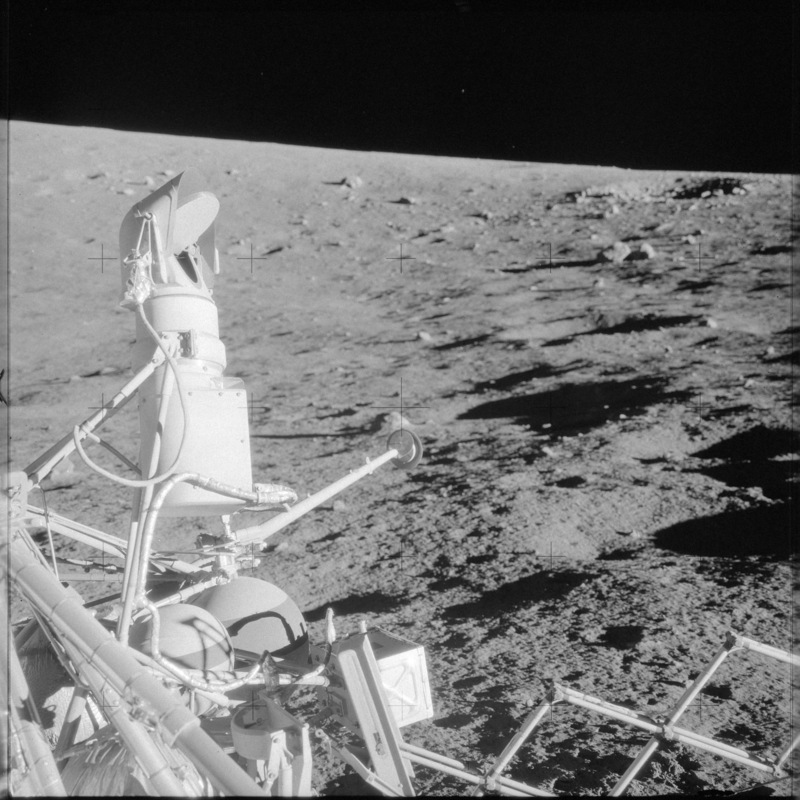 Waring argues that the fact that the same UFO can be found in more than 30 different photos of the same horizon during the same Apollo moonwalk mission proves that the object in the lunar sky was not a flaw in the photograph. An interesting feature of the series of photos that Waring notes is that the UFO appears closer in some photos than others. He also notes variations in angle of view. Waring suggests that the UFO is likely an alien drone that was spying on Apollo 12 mission on the Moon by recording and livestreaming to an alien base. 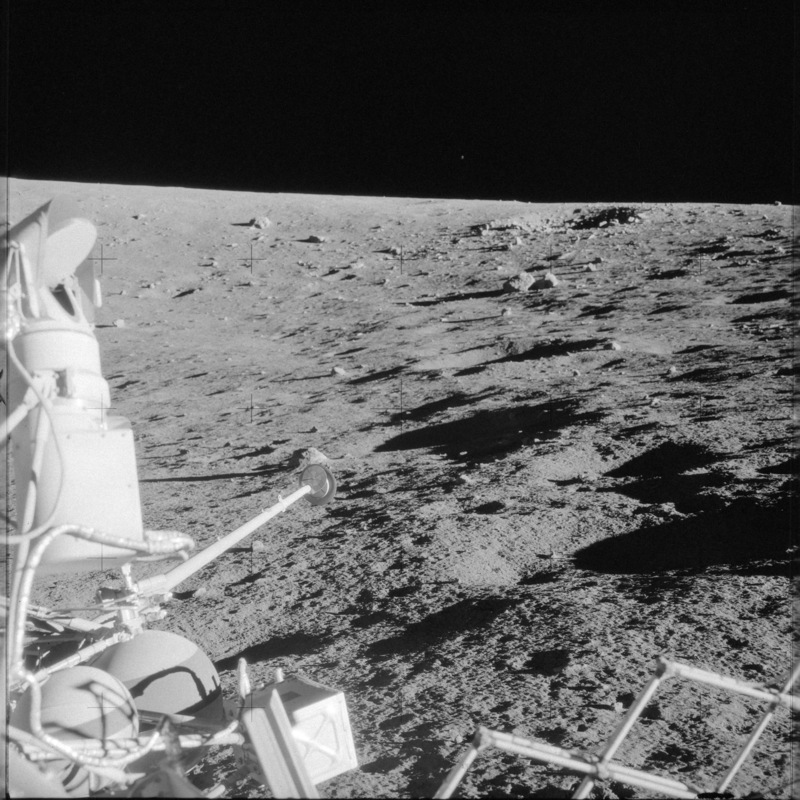 This is not the first time that UFO hunters have claimed “evidence” of UFO presence in NASA Apollo 12 mission photos. Last December, UFO hunters claimed they spotted a rainbow colored UFO in a NASA photo from Apollo 12 mission. Going by repeated claims of alien UFOs monitoring NASA’s 1960s space missions, you could surmise that humanity’s first manned forays into outer space made media headlines in an extraterrestrial technological civilization somewhere out there. Probably what UFO hunters could address with disputable claims of alien UFOs monitoring NASA missions is why the alleged alien UFOs simply lurked in the background watching. Are they sentinel ships of the superpower civilization in our province of the cosmos with a self-imposed duty to police new emerging powers, like the U.S. plays the self-appointed role of global policeman? If that is the case, have they stepped up their surveillance of Earth out of concern about the recent rapid technological progress of our civilization and the prospects that we could one day emerge to challenge their hegemony, like President Obama worries about the rising power of China? Do you think the “object” in the lunar sky is really a UFO, or just a flaw in the photo? Could it be a speck, moon dust on the camera lens, or an astronomical body, such as a star or a planet in the lunar sky?